These models have a permanently installed cable and cannot be autoclaved. Typically used in steel vessels in cheese-starter tanks for the dairy industry, this robust design withstands multiple SIP and CIP cycles, and holds up best under the wash-down conditions since there is no external connector at the electrode head. Steam sterilizable. Standard style F-600 FermProbe sterilizable pH electrode is designed to be used in bioprocess applications where CIP/SIP procedures are used. Built to withstand repeated steam sterilization cycles, the FermProbe quickly stabilizes after steam exposure to be back on-line in half the time of other electrodes. This rugged, low impedance, sterilizable pH electrode continues to provide fast and precise pH measurements even after harsh use and prolonged steam exposure. 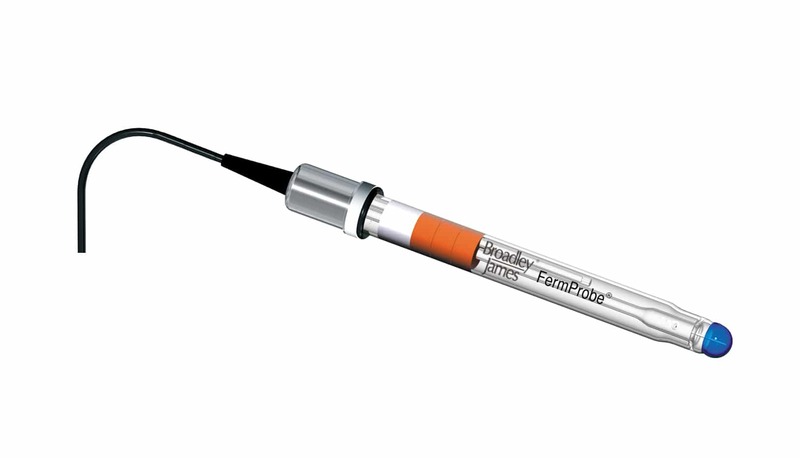 The F-600 sterilizable pH electrode is designed for economy while still retaining all performance specifications. This electrode is secured into the housing with a reusable electrode retainer nut. All housings are shipped with a reusable electrode retainer nut to be used with this style of FermProbe. Most economical, cost effective design. Secures to housing with reusable retainer nut. Rubber strain relief minimizes cable fatigue. Available only with integral cable. Model F-600 pH electrodes come with 6 ft (2m) cable and BNC connector. If you need a different cable length or connector, please call the Sales Department for more information.